R.H.J. Beelen and E.W.A. 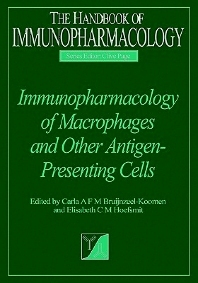 Kamperdijk, Macrophages: General Aspects. A.A. te Velde, Interaction Between Cytokines and Monotcytes/Macrophages. T. Thepen and C.E.G. Havenith, Functions of Alveolar Macrophages. E.W.A. Kamperdijk, E. van Vugt, C.D. Richters, and R.H.J. Beelen, Morphology of Dendritic Cells. D.N.J. Hart and V.L. Calder, Human Dendritic Cells: Function and Cytokine Production. G.C. Mudde, W. Fokkens, C.A.F.M. Bruijnzeel-Koomen, Dendritic Cells in Atopic Disease. P.G. Holt, The Role of Dendritic Cells in Immune Defence of the Airways. W. Allaerts and H.A. Drexhage, Dendritic Cells in Autoimmune Disease. J.A. Roake and J.M. Austyn, The Role of Dendritic Cells in Transplantation. M.S. Roberts, and S.C. Knight, Cyclosporin and Antigen-Presenting Cell Function. The consequences for diseases involving the immune system such as AIDS, and chronic inflammatory diseases such as bronchial asthma, rheumatoid arthritis, and atherosclerosis, now account for a considerable economic burden to governments worldwide. In response there has been an enormous research effort investigating the basic mechanisms underlying such diseases, and a tremendous drive to identify novel therapeutic applications for their prevention and treatment. Though a plethora of immunological studies have been published in recent years, little has been written about the implications of such research for drug development. As a consequence, this area has not gained the prominence of other new fields such as molecular pharmacology or neuropharmacology, and a focal information source for the many pharmacologists interested in diseases of the immune system remains unpublished. The Handbook of Immunopharmacology Series provides such a source through the commissioning of a comprehensive collection of volumes on all aspects of immunopharmacology. Editors have been sought after for each volume who are not only active in their respective areas of expertise, but who also have a distinctly pharmacological bias to their research. The Series follows three main themes, each represented by volumes on individual component topics. The first covers each of the major cell types and classes of inflammatory mediators ("cells and mediators"). The second covers each of the major organ systems and the diseases involving the immune and inflammatory responses that can affect them ("systems"). The third covers different classes of drugs currently used to treat these diseases as well as those under development ("drugs"). Research-level pharmacologists and as a reference work in this area for those involved in degree-level teaching. A Publication of Academic Press U.K.